There are several different models of biometric devices. But the underlying concept of creating users remains the same. 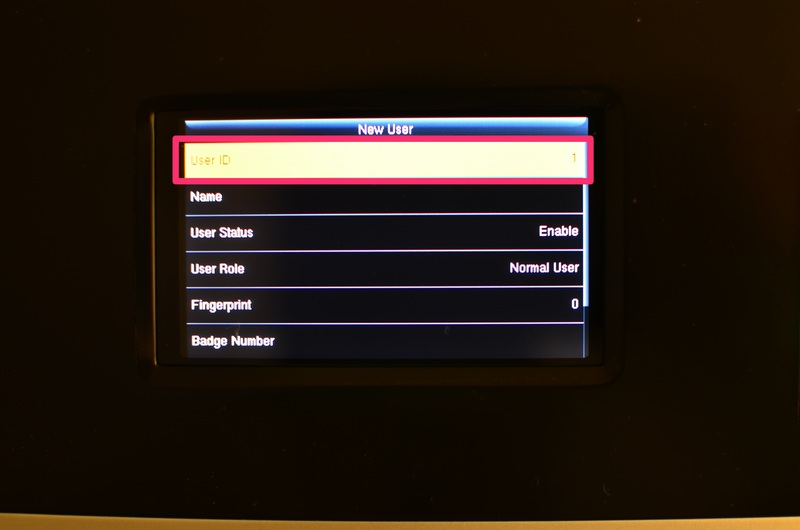 Access your biometric device menu by clicking on the menu button. 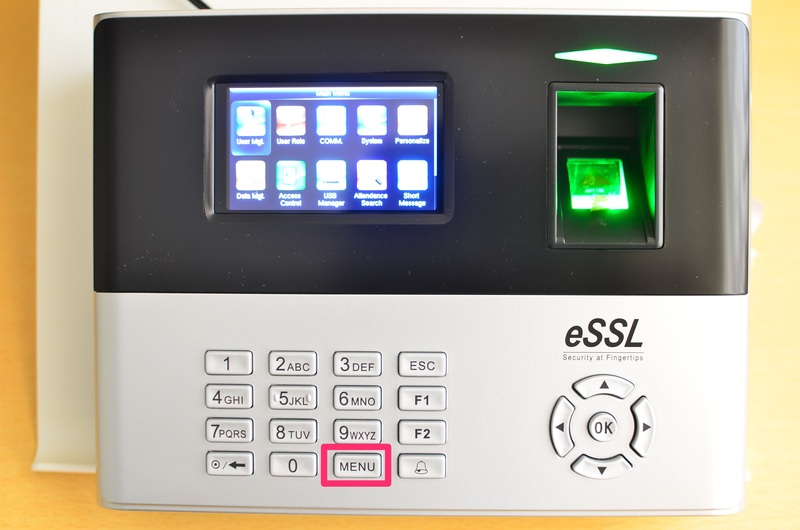 If any one user in the device is marked as an admin, they will need to authorise the admin access to the device with either their Fingerprint, RFID, PIN etc. The device will not allow you to access the admin section without this autorisation. If you do not have any admins on the device, you will be taken directly to the device admin menu. We do not recommend keeping the device in an open state. Please ensure you have at least two admins so that you can access the admin page in case one of the admin's is not available. We also recommend that you provide a PIN number for this user to avoid being locked out of your device due to failure in reading the fingerprint. Once you access the device admin page. 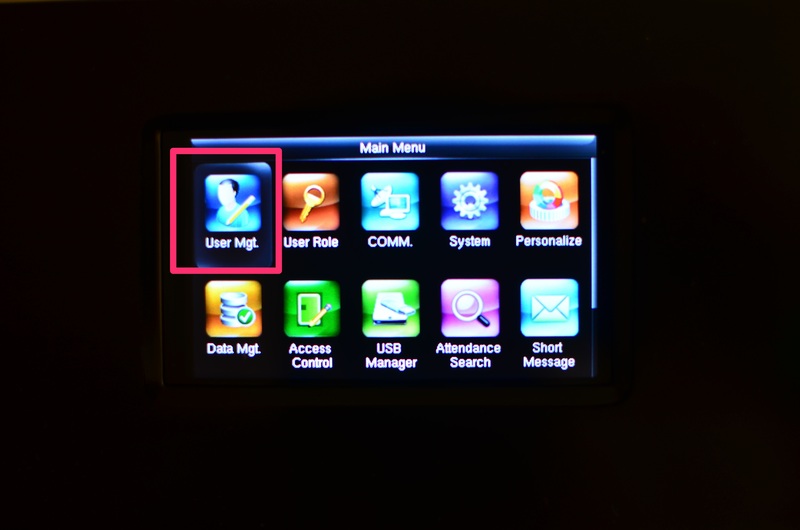 Goto User Management and click ok. Use the arrow keys to navigate the menu. Under user management, click on add new user. By default the enroll ID will be in sequence, You can change this if needed. This us the number that will be used to map the biometric device user with the ClockIt user. You can use alphanumeric as the user id. We recommend using numbers to keep it simple. PRO TIP: Please ensure you maintain a separate spreadsheet to remember which user belongs to which enroll id. If not the only way to get the associated number is by asking the user to punch on the device. Next you will need to set the PIN, Fingerprint, RFID, Facial Scanning etc. 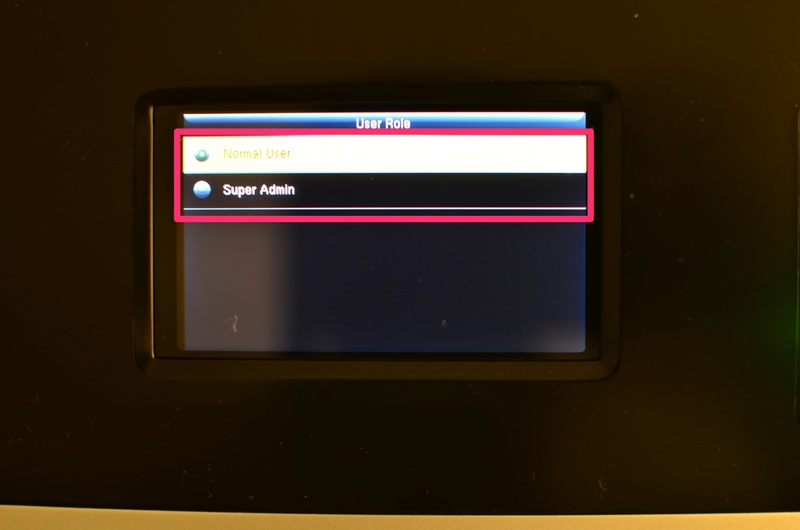 Set the user type admin or normal user under user role. Ensure that you have admin setup correctly to prevent you from being locked out of the device. You will only need one method to identify the user and can choose which one suits your business better. 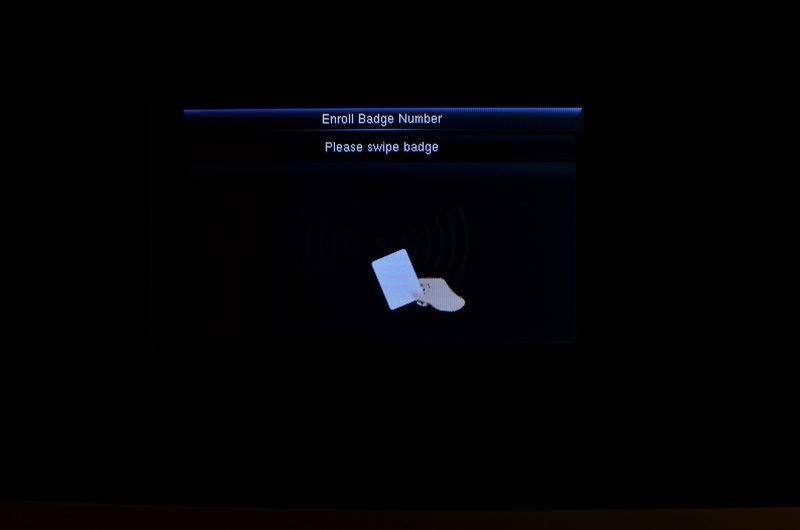 To enroll a PIN, navigate to PIN and set it based on the on screen instructions. 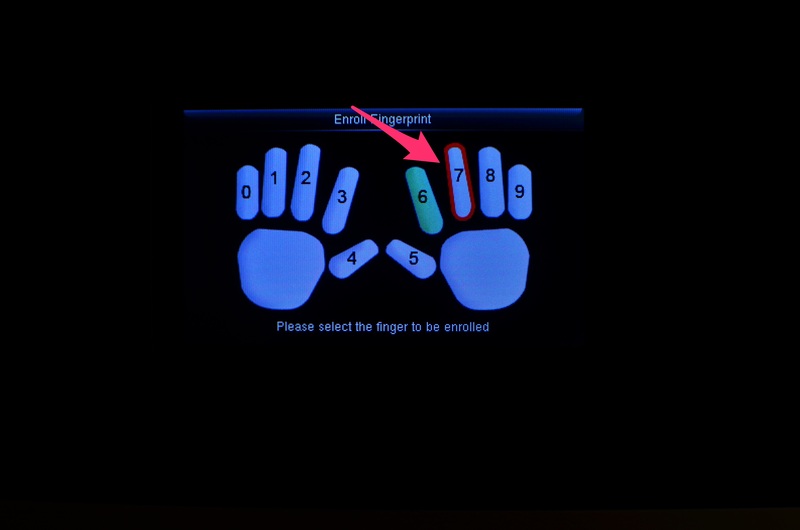 To enroll the fingerprint select FP or fingerprint and select the finger to be scanned. Next place the finger on the scanner 3 times until a positive reading is obtained. Your device may automatically take you to register another finger. You can either press ESC to escape or register a another finger. Pressing ESC will not erase your previous fingerprints that have been scanned. After you press ESC you can similarly set a PIN and the facial scanning on the device itself. If you want to set the RFID for this user, click on RFID and scan the card when prompted. The scanner is located around the fingerprint scanner and you simply flash your card. Once all templates have been scanned and saved, press OK to save the created user on the device. Your newly created user will show in ClockIt within 30 minutes and you can proceed with the device mapping. If you need to edit any one of the user in the device, you can follow the same process.